Want to know how to grow potatoes? You're in luck! Potatoes are one of the easiest vegetables to grow. You don't have to start with a seed, and they will thrive in just any type of climate. And you don't even need a garden! 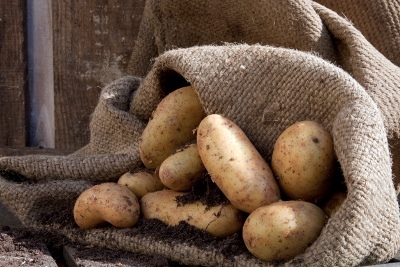 You can grow potatoes in a potato sack, wooden moving box, or any other type of deep container. You can even grow potatoes in old tires! The size and depth of your container will determine how many potatoes your plants produce. Since you probably already have some potatoes in your house, and aren't too fussy about the variety of potato you're going to grow, then you don't need to buy anything. Simply use the potatoes in your larder. If you have grown potatoes before, you know you should keep a few of your old stock to grow the new stock. If you haven't, then keep a few of the potatoes you have on hand and let them "grow out". Simply click any of the images or links to jump to each part of the topic. Click your browser's back button to return to the menu! We all know that after a certain age the "eyes" of the potato will grow into a root, called a stolon. Each stolon has the potential of becoming a potato plant. That means that if you have a potato with several of these, cut it into pieces with one stolon per piece. As a general rule of thumb, every plant will produce at least 10 potatoes. If you're in any doubt about how to grow potatoes in containers from stolen, then plant 50 percent more than you think you'll need. It never hurts to have more potatoes -- you can always give away the excess to your friends or family, or store them for winter. If you have great advice on how to grow potatoes, then please click here to leave your tip for other readers to learn from! Although there are hundreds of different varieties of potatoes, they are classified into seven types. 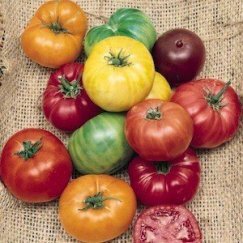 The russet, white and yellow types are larger and might not do too well in a small container, but if you just plant one or two, they should be fine. A potato sack is big enough for about three or four of these larger types, because the tubers grow downwards. Click each name to find the seed potatoes you'll need to grow each variety. The links open into new tabs or windows. Russet Potatoes – Slightly oblong in shape, fairly large, reddish-brown in color with white to yellow flesh. They are great for mashing, frying, baking and roasting. Red Potatoes – Round, fairly small, red skin with white flesh. Great for mashing, roasting, and in salads, soups and stews. White Potatoes – Small to medium, oblong to round, tan color with white flesh. They work well in salads, as mashed, fried and boiled. Yellow Potatoes – Large, oblong shape, yellow skin with golden flesh. They are great for mashing, roasting, grilling and in salads. 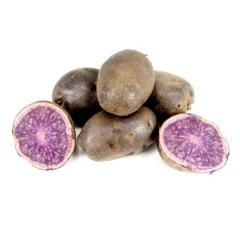 Purple Potatoes – Small, oblong shaped, blueish-purplish skin with pinkish flesh. Used in salads, baking, for grilling and roasting. Fingerling Potatoes – Finger shaped, 2 to 4 inches long, the skin can be red, white, orange or purple with reddish-orange, white, purple or yellow flesh. They add a joyful color to roasts and salads, but are also great for frying. Mini Potatoes – These colorful little potatoes are similar to fingerling potatoes, except much smaller. They make a great change of pace from pasta. This type is especially fun for holidays because they add so much color to the table. And since they are so small, there is not need to peel them. Just boil them or roast them for a fabulous, eye-catching side dish. Whichever type you decide to grow, all are delicious and nutritious. And the best part is that you get bragging rights because you learned how to grow potatoes, and raised them from seed yourself. If you have great advice on how to grow potatoes in containers, then please share for other container gardeners to benefit. The purple potato has a dark purple skin and purplish colored flesh. 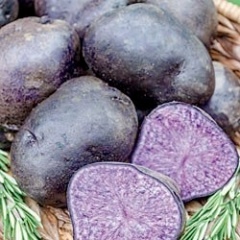 Varieties include All Blue (click to find All Blue seed potatoes at Amazon), Lion's Paw, Purple Peruvian, Vitilette and Purple Majesty. The Majesty has the deepest purple color of all. If you have ever seen purple potato chips, chances are they are not colored, but actually made from a real purple potato. Purple potatoes are generally dry, starchy and earthy with a bit of a nutty flavor. The tubers are generally harvested at an early stage of development, making them quite small. When grown to full maturity, they get much larger and grow into an oblong shape. Unlike their white-fleshed counterparts, purple potatoes have high levels of the antioxidant, anthocyanin, which is often found in purplish fruits like berries and pomegranates. Its high levels of vitamins, proteins, and antioxidants has recently greatly increased its popularity. How to grow potoatoes that are purple? Simply use purple seed potatoes (click to find at Amazon). Smaller purple potatoes are great in salads or boiled. The larger ones can be baked or mashed. You not only get to add a super touch of color to your meals, but you also get additional nutrients, as well. How many potatoes you plant will depend on how many potatoes you want to end up with, and how big your container is. The tubers grow beneath the ground, but even the above soil part of the plant gets quite large. The tubers get their nutrients from the sun and soil, so you don't want the leafy parts overshadowing each other. The ideal soil will have a pH level of 5.5 – 6.5, be well-drained and very rich and loamy. As you learn how to grow potatoes, you'll discover that they are not very fussy, but soil rich with organic matter may give your potato a better flavor and increase your yield. This video will help you to visualize the entire process of how to plant potatoes. After planting potatoes, in about three weeks the plants will begin to emerge. When the above ground part reaches about a foot (30cm) tall hill up the soil about half way up the stem – 6", or 15cm. Don't worry about covering some of the green leaves. 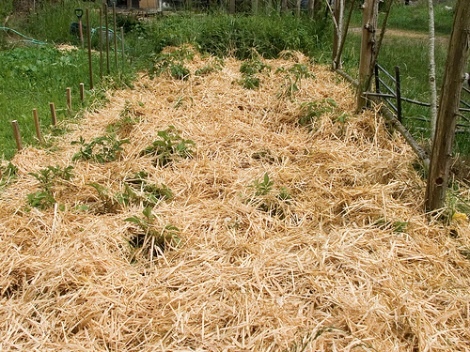 Instead of soil, straw or mulch works too. You can repeat this step a few times over the course of the following weeks. It is not recommended to water the plants from the time of planting potatoes until the sprouts emerge, as this may lead to disease. But after the plants begin to flower, water becomes very important. Potatoes will grow just about anywhere – even in straw. The nice thing about growing potatoes in straw is that you don't have muddy potatoes at harvest time. Just dump the bucket and pick up the potatoes. They come out clean and are very easy to find. To begin, get your container. A half bushel basket works great because there are already spaces in the bottom to let excess water drain off. Put about six inches of potting soil on the bottom and stick your seed potatoes in the soil. In this sized container, you can plant about three potatoes. Hill up the soil to cover the seed potatoes. 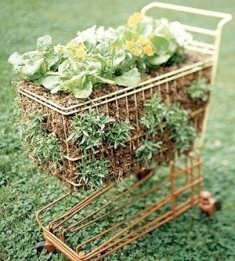 They need a lot of sun, so place your basket where it will get at least six to eight hours of sunlight per day. Water the soil thoroughly, but do not over soak. In about a week or two the plants will begin to emerge. When they get to eight to 12 inches, hill them half way up the stem with straw. Straw that is partially decomposed works the best because you can squish it down to remove air pockets. Do this every time they reach eight to twelve inches tall, and keep the straw moist. Growing potatoes in containers can be done in almost any kind of container, as anybody who knows how to grow potatoes will tell you. Choose a potato bag, garbage can, large wooden box or any other type container – the deeper the better. Just put a good layer of soil on the bottom, lay down your seed potatoes – as many as you have room for without over crowding – and cover them with about six inches of soil. Once the plants reach about a foot, add more soil to cover them about half way, or six inches up the stem. You can keep doing this until the soil reaches the top if the container. The tubers will grow vertically. The more soil you add, and the deeper your container, the more potatoes you will get. Potato plants need plenty of sunlight, and once they begin to flower, the soil needs to be kept moist. If you're short of space and want to know how to grow potatoes, you can still put them anywhere you have a flat surface: a deck, patio or rooftop, for example. Although turning to plastic pots is the common trend, why don't you try this Island Grow Pots 5 Gallon Grow Bag Container? Growing potatoes in containers is popular in Europe. 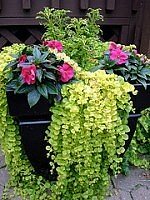 It is a brilliant alternative to customary planting. Traditional plastic pots can damage the roots of your plants, as they tend to develop large, singular roots. This is caused by limited oxygen intake of the roots from the soil - a common case found in root bound plants. Want to know how to grow potatoes successfully like this? One sure way to grow your plants healthily is by air-pruning. This method is efficient in propagating seedlings or potted plants for restoration. During the process, the roots are exposed to air without high humidity, causing the roots to burn off; producing new and healthy branching roots constantly. The same theory is utilized in the Island Grow Bag Container. The fabric of the pot allows the plants to air-prune by themselves. Plants will now grow into their full capacity, as their growth is no longer restricted when compared to plastic pot and containers. Contrary to plastic pots, utilizing the Grow Bag assists the plants to develop multiple small clusters of roots, making it possible for plants to receive more oxygen and improved water delivery, by allowing water to flow as freely as possible through the soil and roots, at the same time carrying and distributing oxygen to all areas of the roots. This fabric pot also effectively absorbs more nutrients than the conventional plastic pots. Plant nutrients are considered precious (and expensive!) - none of it should go to waste. 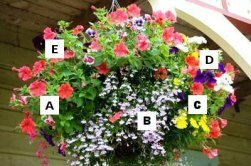 It can hold up to 5 gallons worth of soil, enough for planting potatoes, tomatoes, crops, herbs and spices, flowers, bushes and even dwarf palm trees. Expensive: Although the product is remarkable, it is still a pot meant to hold a single plant. You would have to spend a fair amount of cash if you are planning to grow lots of potatoes in containers like this one. 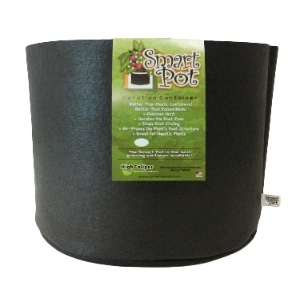 The Island Grow Pots 5 Gallon Grow Bag Container is the solution to a lot of your container potato gardening dilemmas. Plants grow healthier and happier even with little attention since this Grow Bag that does most of the work for you. A lot of home growers say that one of the reasons why they enjoy planting their own crops is the joy of harvesting. Potatoes are among their favorites, they would often refer to it as 'unearthing handsome nuggets of potato from a chocolate-brown soil'. Learning how to grow potatoes in containers is not all that simple for some people though. Spacing, plant care... how do you know you're doing it right? Although this rambunctious vegetable is easily grown, a lot of space is often needed, since rows require 18 inches between them. The humble potato is happy to grow just about anywhere; that's why many space-starved gardeners turn to container gardening. One product to check out when trying to grow potatoes in containers is this Bosmere P575 Potato Deck-Patio Grow Planter Bag. This Potato Deck-Patio Grow Planter Bag offers a solution to your gardening woes. You can place the grow bags on the back porch, patio, deck, balcony or as part of a large garden area. It is made of flexible polyethylene. It features drainage holes in and around the bottom and strong webbing handles at the top for moving the bag around if need be. The handles also make it convenient for people with limited mobility. Measuring 18 inches tall by 14 inches wide, it can accommodate around three to five potato plants. This height is also deep enough for supports to hold up the plants if needed. Specific and easy-to-follow instructions also come with the bag. Follow the instructions religiously and make sure that the potatoes fully covered with soil, never exposed. It is also very important to try and contain your eagerness to dig up those golden spuds, or you'll end up with tiny, immature yields. Stretch your patience if you want better results. One-time use only: The bags have a tendency to fall apart the 2nd time you use them. The Bosmere P575 Potato Deck-Patio Grow Planter Bag is great for a one-time thing. After holding soil and spuds for a while, the sides tend to bow out and rip and cannot be reused for planting a second batch. This is expected though since the bags are only made of plastic. It can still be considered a good buy, since it does its job well while it lasts. Your alternatives -- to use large boxes or pots -- are very heavy, and difficult to move around. Gardening is no longer just a pasttime or a means to make a living. Many households are now into producing their own food, as this will guarantee them safety from all the damage brought about by genetic engineering, chemicals, and pollution. Potatoes, being rich in carbohydrates, have been considered one of the major staple foods. 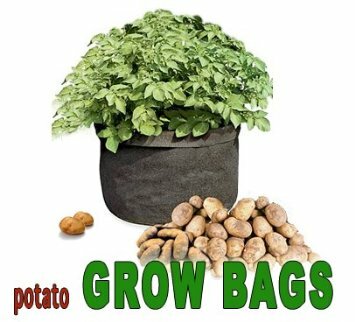 A limited space in no longer a hindrance to growing your own crops; you'll only need quality potato seeds, good planting soil and these Potato Grow Bags. If you have had any experience in growing potatoes, you will know that they prefer raised garden beds. However, some growers do not exactly have the comfort of a wide garden space. Fortunately, there are other available solutions for growing potatoes in containers. These Potato Grow Bags will be exactly what you need in cultivating quality potatoes no matter how limited your garden space is. This Potato Grow Bag is made of a patented, double-layer geotextile polypropylene fabric. The felt-like fabric material permits proper aeration of your potato plants. The porous fabric also air-prunes plant roots which will result to a healthier and robust root system. Unlike plastic, the material of this bag prevents overwatering and poor aeration. The bag measures 18 inches in diameter by 14 inches high and can hold 15 gallons or 60 quarts of soil. Each package will include two Potato Grow Bags, and each bag can plant up to 5 seedlings. You may also use these to plant tomatoes, peppers, melon, strawberries, herbs, and more. 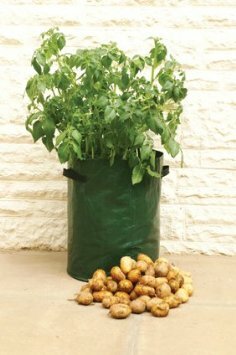 These Potato Grow Bags can accommodate a maximum of 5 plants in each bag for a larger yet space-saving harvest. The felt-like fabric is very sturdy and a great help in providing good air flow for the roots. Albeit quite expensive, this quality is worth the purchase if you want to know how to grow potatoes successfully. Have a super idea on how to grow potatoes better? Please click here to let other gardeners know. Harvesting potatoes is not that difficult. The plant tells you when it's time to dig up your treasured spuds! Baby or "new" potatoes can be harvested about eight weeks after planting. For "fresh" potatoes, wait until the leaves on the plant begin to die. When you're harvesting potatoes, pull out the entire plant. Pick off the ripe potatoes, wash them and store them in a cool, dark place. Some of the potatoes might fall off when you pull out the plant, so check through the soil for any "lost" potatoes. Check out this great video on how to grow potatoes and harvest them to see how it's done. Of course, you will want to empty the container after harvest, so you can do a thorough search when you dump the soil. It's not a good idea to save the soil for next year as this might encourage blight or other diseases. Plus, much of the nutrients will be used up, so the soil will not be very healthy. 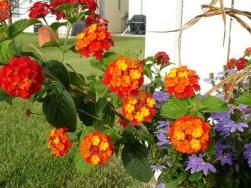 Large amounts of manure and fertilizer may help this, but it is better and easier to just use fresh soil every year. Fresh soil will also ensure you aren't bringing any old slugs or infestations into your new crop. Storage or "winter use" potatoes should not be harvested until the plant has completely died or been cut down. The potatoes should be left in the soil for about two weeks after the plant has died off, or you can simply take the whole container, as is, and transport it to a cool dry place. The container and soil provide a safe storage space for your potatoes. If you want to remove the potatoes from the vine first, take them from the soil and put them into paper sacks. Under the right conditions, potatoes can be stored for several months. After harvest, lay your potatoes out in a cool, dark place on a bed of newspaper. The skins will dry and thicken in about two weeks. The thicker skin preserves the potato longer. If you want to wash your potatoes, do it as soon as you pull them from the ground. Any dampness left on them after drying will promote rotting. Examine your potatoes. Any with damage or broken skin should be used right away, as they will be the first to rot and cause the others to rot, as well. Place the potatoes in a single layer in ventilated wooden or cardboard boxes, or in baskets. Put down a layer of newspaper and continue layering. The top layer also needs to be covered with newspaper or cardboard. The newspaper blocks light from the potatoes. If the potatoes are exposed to light, then they will either sprout, reducing their shelf life, or turn green, making them inedible. Keep your potatoes in a dark place at about 35 to 40° F (2 to 4° C). Do not let them freeze. Frost will turn them black and ruin the taste. Check on them every once in a while and remove any with signs of rot, sprouts or frost bite. Also remove any that are going soft. Have a Hint For How to Grow Potatoes? If you are an expert on how to grow potatoes, then please click here to leave your tip! What's wrong with your potato plants? Learning how to grow potatoes in containers means keeping an eye on the plants for signs of disease or infestation. 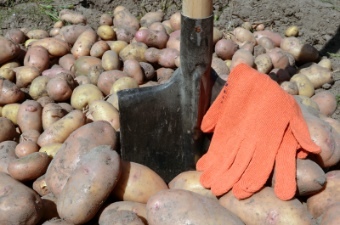 Use these potato care tips to deal with any potato growing problems. You can also employ Procidic (see below) to help prevent and/or treat various bacteria, mold, and infestation problems. Blight is a fungal. Blotchy leaves are the first sign that your potato plants may be infected. This stage is quickly followed by rotting stems and tubers. The condition will usually develop in warm, moist situations from midsummer on. Sarpo mira potatoes, from the red potato family, are the most resistant to blight. Planting sarpo mira potatoes, which are resistant to blight. Using high quality seed potatoes. Start harvesting potatoes early, before blight has a chance to develop. Water regularly to minimize the chances of "cracks" or splits on the skin. Water the ground around the plant, not the leaves. Blight spores have to land on wet foliage in order to infect the plant. If your plants do contract blight, cut them off and burn them. Leave the potatoes in the soil for a few days to let the skins set and then dig them up. Hopefully they will be fine. Common potato scab is a bacterial disease, found in many soils. It produces patches of a cork-like tissue on the surface of the potato. Damage is usually superficial, and the infected potatoes are still edible. Grow varieties which are resistant, such as golden wonder and carlingford. Scab is much likely in alkaline soil. Do not lime soil before planting. Put a layer of compost or grass clippings at the bottom of the container. Eelworm is a microscopic pest that can survive in the soil for about 20 years without any potato or other similar crop. That is why using fresh soil every year is very important. 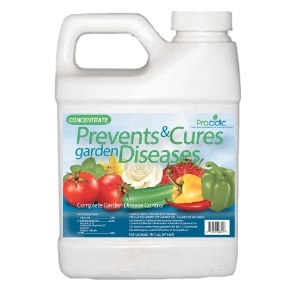 Make sure the soil you use is free of pests and disease. An infected plant will die off early, reducing your yield. If you suspect eelworm, check the roots in July/early August. Expose the roots very carefully and look for white, yellow or brown pinhead-sized cysts. You might need a magnifying glass to see them. Tomatoes are also susceptible. Using certified seed potatoes, guaranteed to be pest-free. Use fresh, clean soil with plenty of high quality compost every year. 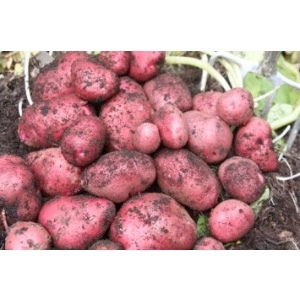 Use resistant potato varieties, such as Valor, Sante, Swift, Kestrel, Nicola, Nadine, Maris Piper, Cara and Pentland Javelin. Improve the soil quality with compost and composted manure. Early potato harvesting will prevent an attack from taking hold. If you have something to add about potato plant care and disease or pest control, then please click here to leave your tip for other readers to learn from! Potato blackleg is a common bacterial disease, especially in wet seasons. The leaves will turn yellowish or pale green. The stem turns dark brown or black about five inches above and below the soil, and can wilt or die. Not every stem on the plant is always affected. With a bad attack, the tubers might rot while still in the ground. Often, when you pull up the potatoes, they will look completely normal, but then rot during storage. Do not let your container get waterlogged. If you are getting a lot of rain, put some sort of roof or cover over the container. Use less susceptible varieties such as Osprey, Kestrel and Merlin. Don't use varieties known to be susceptible such as Maris Bard, Epicure, Wilja and Estima. Allow potatoes to dry completely before storing. Slugs will make holes and galleries in your potatoes. The most common are keeled slugs, which live in the soil. Choosing less susceptible varieties such as Romano, Pentland Dell, Kestrel and Charlotte. Maris Piper, Maris Bard and Marfona are particularly susceptible. Harvest your plants by early September. 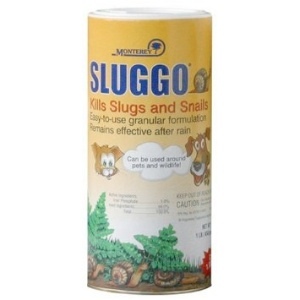 Kill the slugs Sluggo, an organic method of pest control that is highly recommended by other gardeners who use it. Pest and disease control when you're growing potatoes in containers is not hard at all. These potato problems can easily be avoided if you use fresh, clean soil mixed with compost, and keep the soil moist, but not wet. Whenever the plant grows about a foot above the soil, add more soil, compost or both, until the container is full. Within just a few months, you will have healthy potatoes that taste great. Do you have any tips on how to grow potatoes in containers? Please share them by clicking here. Other visitors will thank you. Discover More Container Gardening Tips!